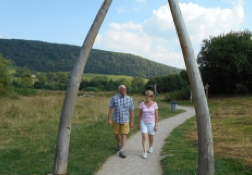 Meet our Mammoth, enjoy our exhibition and explore our 30 acre meadow! Based in the stunning Shropshire Hills, on the side of the A49 in Craven Arms, we are surrounded by beautiful countryside, the perfect place to begin your exploration of the area. EXPERIENCE the Shropshire Hills Through Time exhibition. 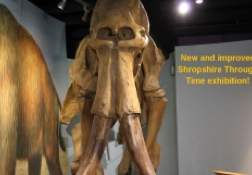 From start to finish, use all of your senses to explore the Ice Age through to the present day here in the Shropshire Hills Discovery Centre. RELAX in our award winning café. With frothy coffees, homemade cakes, local lunches and Shropshire cream teas, our café is the perfect place to get a true taste of the Shropshire landscape. Our menus and specials of the day are all prepared from scratch, on site and with Sunday lunches a firm favourite, we are the place to be if you fancy a roast. EXPLORE our 30 acres of riverside Meadows. Walk, skip and cycle through our trees, past our dragonfly and butterfly hotspots and along our River Onny. Enjoy our all ability access paths, perfect for wheelchairs and pushchairs so that everyone can enjoy being in the great outdoors. Well behaved dogs are welcome in the meadows only so you can enjoy your picnic or food from the café on our benches. DISCOVER with our visitor information service. Our friendly and experienced team are on hand to answer your questions and advise you on the best places to explore when you leave us. LOVE our unique range of gifts and treats in our shop. Get that perfect gift as you take home a little bit of Shropshire. With an extensive range of books and maps, start your walk from here or pick up some food or drink from our local producers. Maybe you fancy a book on the area or you need to get those souvenirs from your trip? We have something for everyone and all occasions. PLAN your group visit, coaches are always welcome! 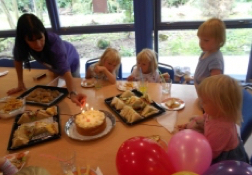 Run by local charity, Grow Cook Learn, we are committed to connecting people to the food, history and landscape of the Shropshire Hills from our base in the heart of the Craven Arms community. Our mission is to continue developing our Centre as a vibrant visitor attraction, a haven for wildlife and a resource for local residents. We rely on donations alongside the income from our café, exhibition and shop to keep the Centre open for everyone to enjoy and to continue delivering our charitable aims. To donate to our cause, click here. 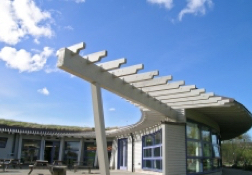 The Centre is open 7 days a week, 10am-5pm.